One thing I emphasize with all of my guitar students is the importance of using a metronome when practicing. Most of my students are initially resistant to the idea of using one. Some remain resistant to it, while others eventually embrace the metronome as a practice tool. I can usually see a clear distinction in the playing of my students who make a habit of using a metronome compared to those that don’t. The students that do use one tend to have much smoother playing, better technique, and are able to learn difficult songs more quickly. Using a metronome isn’t just something I push on my students. To this day, the metronome plays a major role in almost every form of practicing that I do. Like many beginners, I didn’t use one much in my first few years of learning to play the guitar. But, once I did start using one, my playing started to take off and I really kicked myself for not starting sooner. So, why exactly is the metronome such a good practice tool? Read on and I’ll go through the benefits of using a metronome, as well as different ways to use it when practicing. I’ll start with the most obvious reason, and the one that most musicians give when talking about the metronome. It improves your timing, or your sense of rhythm. What exactly does that mean? Well, generally it means it enhances your sense of where the beat is, and how each beat is divided up. One major rhythmic problem that almost all beginner, lower intermediate, and sometimes even advanced, guitarists have is a lack of awareness of the beat or ‘pulse’ of the music when playing. Ideally, you should be able to feel that pulse going on underneath anything that you’re playing. You should be able to tap your foot, nod your head, or in some way move with it. Many players can’t do that, and when asked about it they’re unable to identify exactly where the beat is even if they were playing a rhythm correctly. Equally important is having a sense of how each beat is sub divided into smaller parts depending on whether you are playing eighth notes, sixteenth notes, triplets, and so on. Often even if a less experienced guitarist knows what these types of notes are, they have trouble correctly laying them into the beat that they’re playing to. Consistently practicing with a metronome forces you to pay attention to where the beat is and how all the notes are fitting in to each beat. This can be a difficult skill to develop, and sometimes I have to really work with a student to help them get a sense for how to do it. Any time you see a guitarist demonstrating great technique, whether it’s an electric guitarist playing a smokin’ fast solo, or a classical guitarist gracefully flying through an intricate section of music, that skill is the result of lots of work with a metronome – both fast and slow. To eventually be able to play fast, you have to gradually build your speed. You have to train your physical movements and your mind to cope with the increasing demands that playing fast puts on them. The general way to go about doing this is to take whatever it is you’re working on, slow it down to a speed where it feels easy to play, and then gradually increase it until you reach the speed it’s meant to be played. Depending on the difficulty of what you’re practicing, this could take anywhere from a single practice session to months to accomplish. Working with a metronome enables you to increase your speed in subtle increments so that each increase is almost unnoticeable from one speed to the next. Without a metronome, you would likely end up increasing your speed in increments that are too large. Also, the metronome will ensure that you don’t slow down in particularly difficult spots once you start getting up to a higher speed. Slowing down in these spots could happen unconsciously without a metronome keeping you locked in on the beat. Sometimes, practicing very slowly is necessary for building better technique. If you are trying to work on the subtleties of your picking movement, or train your fingers on a series of difficult chord changes, you have to take it slow to really ingrain the right movements into your muscle memory. Almost all beginner and intermediate guitarists practice this type of thing too fast. 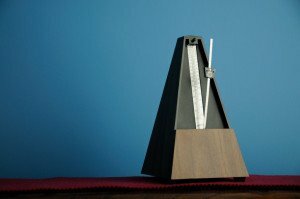 Using a metronome can help slow you down. Much in the way that it can prevent you from slowing down at higher speeds, it can also prevent you from speeding up at slower speeds if you are locked in on the beat that the metronome is giving you. If you want to really slow things down, let the metronome click more than once per beat. In other words, instead of having each click from the metronome represent a quarter note, or one beat, think of each click as representing an eighth note (½ of a beat) or even a sixteenth note (¼ of a beat). This is useful when you’re practicing something that is very difficult or complex from a rhythmic standpoint. If you have trouble with gradually speeding up or slowing down as you play a song, the metronome can help. In fact, it’s virtually impossible to work on this issue (which is a very common problem, even in drummers) without the use of a metronome, since it happens so gradually that you could be unaware of it. It’s possible that you might have this problem even if you practice with the metronome on a regular basis in the ways that I’ve already described. When the metronome is clicking once or more per beat, it’s giving you a lot of guidance and keeping your tempo in check. The problem of dragging or rushing the tempo could then arise when you go back to playing without the metronome, and relying solely on your own sense of timing. The way to address this problem is to have the metronome give you less guidance. Instead of having it click once per beat, set it going really slow to where it clicks once every 2 or 4 beats. This will force you to rely more on your own sense of timing and tempo, with the metronome giving you just enough feedback to know if you are speeding up or slowing down. If you already have trouble keeping in time with a metronome when it is clicking once or more per beat, this isn’t the best exercise for you. In that case, you need the extra guidance that the metronome gives, and you should focus on getting better at using it in that way. On the other hand, if you are able to easily keep in time with a metronome but have tempo issues when not playing with one, this is the perfect exercise for this problem (and one I wish more drummers would work on!). Another great reason for practicing with a metronome is it gives you a very precise knowledge on where you stand with what you are practicing, as well as your rate of improvement. You either can or can’t play that song/exercise/scale at a certain speed, pure and simple. This is important from the standpoint of both using your practice time efficiently, and motivation. Knowing the speed at which you are no longer able to correctly play something helps you instantly lock in on what needs to be worked on. And, seeing that speed gradually go up gives you evidence that your practice is helping, which then motivates you to keep practicing! If and when you get to the point where you are trying to make a good recording of something, playing to a click track can help the process along. A click track is basically just a metronome that you hear through a set of headphones while you record. It’s common practice for musicians to listen to a click track when recording in a studio to guarantee that multiple takes of a song are played at an identical tempo. This makes editing easier, since you could possibly cut and paste pieces of different takes together and make them sound seamless. It also ensures that the band doesn’t rush or drag the tempo, and that the song is played at exactly the tempo it was intended to be played. If you haven’t practiced much with a metronome before doing this, it’ll be quite difficult. But if everyone in the band is used to playing with a metronome, using a click track in the studio will be no problem at all. Posted in General Advice, Practice and tagged Metronome, Motivation, Practice, Technique.